This picture of my granddaughter is one of them; one of memory making moments! Summer vacation, jumping in the pool, laughing, staying up late to walk the beach. . . all fun memories. Not all of our memory making moments are on vacation though. A huge part of them happen around our dinner table. Sitting around the dinner table is the time you get to talk, to listen, to laugh, but mostly, this time is where some of the best memory making moments happen. Take advantage of it!! Use the dinner table to talk to your kids, your spouse, your friend, your parents . . . you’ll learn a lot, you’ll build your relationships, you’ll love and appreciate more, you may even experience the best memory making moment ever! But, it all starts with decision to make it happen, along with the other decision. . . WHAT TO MAKE FOR DINNER! LOL!! When our daughter was little, I loved quick and easy meals that were good for us, not a lot of mess to clean up, and that was delicious. Now, I have always been the type of cook who just “threw things together” without a recipe, but not everyone is like that, so I searched online for a recipe that was very similar to one of my creations, and I found one!!!! It’s from Southern Living and it’s pretty close to what I used to make for my family. Quick, easy clean up, healthy, and delicious, which all adds up to having more time available around the dinner table for your memory making moments. Preheat oven to 475°F. 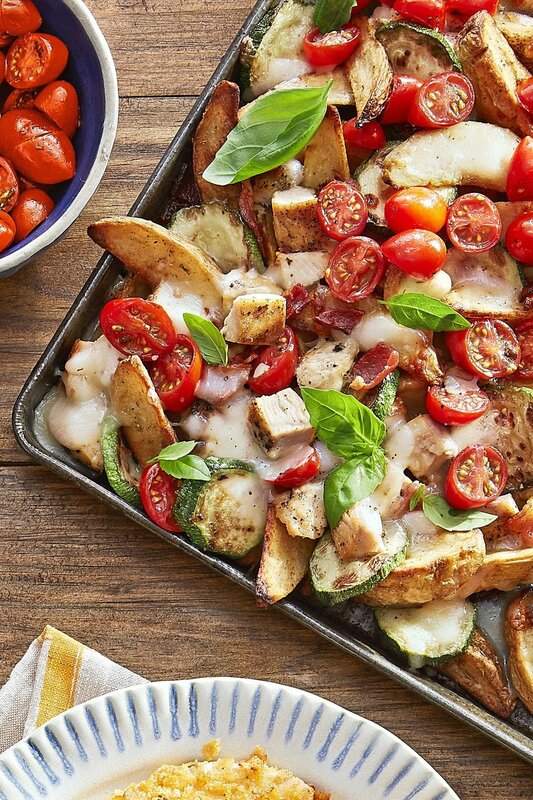 Bake oven fries, zucchini, and bacon in a single layer on a lightly greased baking sheet, stirring once, 15 minutes. Meanwhile, season chicken breasts with Italian seasoning, and kosher salt and black pepper. Cook in 1 tablespoon olive oil in a medium skillet over medium-high heat until cooked through, 5 to 6 minutes per side; chop. Push potatoes to middle of baking sheet and top with chopped chicken and Italian five-cheese blend. Bake until cheese is melted, 3 to 4 minutes. The best part of this recipe is versatility; you can add other ingredients like peppers, onions, or even serve it with some marinara sauce! !